Why would I need self storage in Bellevue, WA? There are a variety of reasons why you might need self-storage in Bellevue, WA. How much is a storage unit in Bellevue, WA? The cheapest storage unit in Bellevue, WA is $45.00 per month. What size storage units do you have available in Bellevue, WA? In Bellevue, WA we have sizes that range from 3'x5' to 14'x35' to suit your storage needs. How much is it for a 3'x5' storage unit in Bellevue, WA? The cheapest 3'x5' storage unit in Bellevue, WA is $46.00 per month. Bellevue, Washington, offers a unique combination of a big-city economy with a small-town feel. The city's name stems from the French words for "beautiful view." One local legend says that the name was given by the city's first postmaster, while others attribute it to the birthplace of many of its settlers, a town in Indiana with the same name. In any case, there's no doubt that Bellevue has impressive scenic views; on a clear day, you can see both the Cascade and the Olympic Mountains from many points within the city. Initially, Bellevue was a densely wooded area with just a handful of settlers, until coal was discovered near Coal Creek in the early 1900s. The mining industry sparked growth in the area, soon followed by a thriving logging industry. Today, what was once a small bedroom community has grown into one of Washington's largest cities, experiencing leaps in growth as recently as the early 2000s. Bellevue has become a major technology and retail hub in the region, which accounts for many of the towering skyscrapers in the downtown area. Image via Flickr by .curt. If you're planning on moving to the Bellevue area, you're part of a growing trend. Once considered a relatively quiet town, Bellevue has recently transformed into a high-tech metropolis. Today, a significant number of people from outside the city commute into Bellevue for work, making it one of the largest employment centers in King County. The city's unemployment rate has consistently remained lower than Washington's state average. The service and retail industries are the largest sectors of Bellevue's economy. High-tech firms have also flocked to Bellevue, including video game, software development and Internet services companies. Several large public companies in the state of Washington call the Bellevue area home, including Microsoft, Expedia and Puget Sound Energy. Other large employers in Bellevue include Boeing and the Bellevue School District. The downtown area is one of the fastest-growing places in Bellevue, with a diverse group of families, young professionals and retired seniors calling it home. The Bellevue Arts Museum and annual Jazz Festival are just a few of the many opportunities for arts, culture and entertainment. Bridle Trails is the area Bellevue horse lovers call home, with many of the homes accompanied by large grazing pastures and extensive trails. The neighborhood is committed to preserving its surrounding natural area, and has even taken on additional restrictions to help protect trees on both public and private land. Though cougars are rarely spotted in this Bellevue neighborhood, don't be surprised if you see other wildlife, including deer, opossums, raccoons and even bears from time to time. The mountainous area hosts a large pedestrian trail network, connecting to the nearby Cougar Mountain Park. 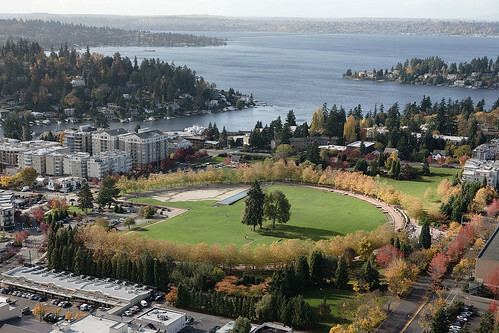 The Lake Hills neighborhood dates back to the 1950s, and is one of the most populated areas in all of Bellevue. With a balance of developed communities and natural preserves, Lake Hills is known for its extensive blueberry fields and wetlands areas. The Bellevue School District (BSD) serves most of the city and some of the smaller nearby communities, such as Clyde Hill and Medina. It also has a number of language immersion and dual-language schools, with a high percentage of students speaking more than one language. You can also consider a variety of private schools, including those that provide educational tracks that are faith-based, Montessori and Waldorf-style. If you're pursuing your degree, Bellevue has several colleges and universities in the area, both small and large. Among the local schools are Bellevue College and the City University of Seattle. Power: Puget Sound Energy is the electricity supplier for Bellevue. Water: Water services are managed by the City of Bellevue. Because the city encourages water conservation, you can receive free or discounted conservation items for your home. Garbage and Recycling: The City of Bellevue provides all waste management services, including weekly collection of trash, recyclables and organic matter. If you're interested in making home compost, the city offers compost bins at no cost to you. Transportation: Because Bellevue has a large number of inbound commuters, there is a range of transit alternatives to driving a single-occupancy car. You can take advantage of bus and vanpool services, and the city provides resources for finding a carpool near you. The median home value in Bellevue is considerably higher than the U.S. average, and it's steadily risen over recent years. This is largely due to the high demand for housing in the area, thanks to the significant growth of the local economy and the arrival of many large corporations. Our lowest priced units in Bellevue, WA average $52.43 per month. 300 people have reserved units in Bellevue, WA in the past 30 days. There are 7 locations within Bellevue, WA's city limits. There are 2 locations in Bellevue, WA that offer AC and Heating features.